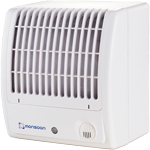 The Monsoon D-Series Axial fan range for domestic kitchens and bathrooms. 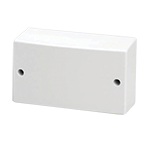 Suitable for wall or panel mounting and available in sizes 100mm and 150mm. For technical datasheets, please contact us on 01823 690290. 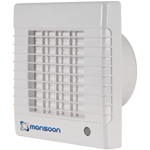 The Monsoon MA-Series Axial fan range available in sizes 100mm and 150mm is designed for domestic bathrooms and comes in a range of options such as timer, humidistat, movement sensor and pull cord. For technical datasheets, please contact us on 01823 690290. The UMD mixed flow fan Domestic range can be used for exhaust and supply ventilation systems that require high pressure, powerful airflow and low noise levels. The UMD range is a ideal solution for rooms with high humidity such as bathrooms and kitchens. For technical datasheets, please contact us on 01823 690290. 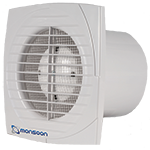 The Monsson Centrifugal Bathroom fan series is designed to handle high pressure with low noise levels and comes in five models from, Standard, Timer, Pull-cord, Humidistat & Timer and PIR. For technical datasheets, please contact us on 01823 690290. Monsoon Transformers TVL. For technical datasheets, please contact us on 01823 690290. Range of 100mm/125mm/150mm/110x54mm gravity grilles. Available in round and rectangular. 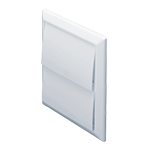 White, Brown, Cotswold Stone, Terracotta and Black.For technical datasheets, please contact us on 01823 690290. 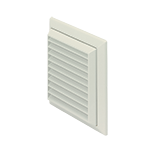 Range of 100mm/125mm/150mm/110x54mm fixed grilles. Available in round and rectangular. White, Brown, Cotswold Stone, Terracotta and Black. For technical datasheets, please contact us on 01823 690290.